Swept off the market in just three months since it was listed, the 1938 Colonial Revival home of Ronald Reagan and Jane Wyman, designed by architect-to-the-stars, Paul Williams, sold for the first time in 64 years for $6.45 million. When Ronald Reagan got his first starring role at age 27 as Dan Crawford in ‘Brother Rat’ in 1938, his success not only drew the attention of the film industry but also of his co-star, Jane Wyman. She was only 21 but after meeting the handsome Reagan, she soon divorced her second husband and married Reagan in 1940. Between each working hard to advance their film careers, the life disruptions of World War II and afterwards the time Reagan spent working against the Hollywood blacklist, and the death of their premature baby, their marriage ended in 1948. Wyman continued to live in the home for many years after Reagan moved out. The elegant home of Ronald Reagan and Jane Wyman sold after only three months on the market. 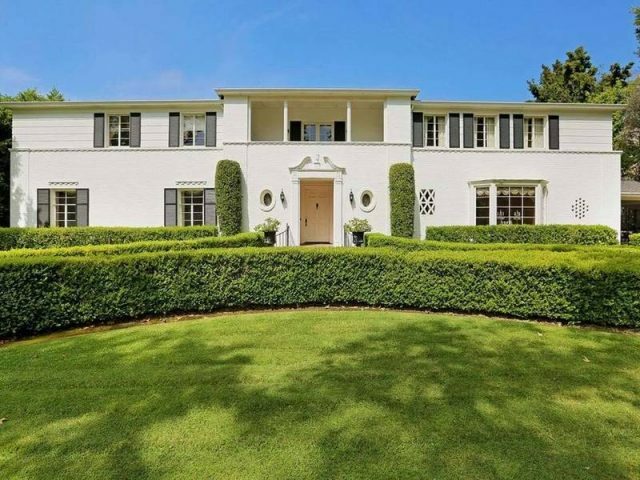 Designed by architect Paul Williams, it was the epitome of Old Hollywood glamour. Selling for $6.45 million, co-listing agents Christophe Choo and Joyce Essex Harvey of Coldwell Banker Residential Brokerage arranged the sale. The Hollywood Hills home once owned by Hal B. Wallis, former head of Warner Bros., where legendary actor James Dean lived in a rented room during the year he made ‘East of Eden,’ ‘Rebel Without a Cause,’ and ‘Giant,’ is now for sale, priced at $3.995 million. Having just completed ‘East of Eden,’ Dean met the casting director for ‘Rebel Without a Cause’ at a party held there. Privately tucked away behind its gated wall and overlooking the canyon, the 1927 Spanish-style house has undergone an elegant transformation since Dean’s time while retaining and highlighting its original architectural features. Sited on a double lot, the 4,000-square-foot house includes three bedrooms, four baths, sunroom, chef’s kitchen with marble countertops and Viking appliances that are open to the dining room. White walls are a foil for the dark hardwood floors, beamed ceilings and views of the green landscape through large arched windows and ceiling-to-floor glass walls filling the home with cheerful light. Dean’s quarters were on the lower level, which include a living area with fireplace, an en-suite guest room, terrace and private entrance. Grounds have a stone pathway through the foliage and mature trees leading to an outdoor dining area, pool and spa. Perfect for entertaining, the house was considered a party hub of the film industry during the 1950s. Brooding, sullen and with the promise of mystery behind his oftentimes menacing stare, James Dean was the personification of the troubled youth of the mid 1950s just when teenagers were first beginning to rebel against society’s staunch up-tight morality. Dean made only three films, all in the same year at the age of 24, but they were so powerful they remain top classics today. After the completion of his last scene in ‘Giant,’ while on the way to race his new Porsche 550 Spyder in Salinas, California in 1955, he was killed in a wreck at a highway intersection. He was only 24 and of the three films he had only seen ‘East of Eden’ as the others had not yet been released. Priced at $3.995 million, the listing agent for the former James Dean rental is Eric Lavey of The Agency, Beverly Hills.